McGill@Expo 67, an exhibition at the McGill Library celebrating Expo 67’s 50th anniversary, showcases the University’s rich collections of photographs, souvenirs, drawings and passports from the seminal event. The exhibit closes on Dec. 21. 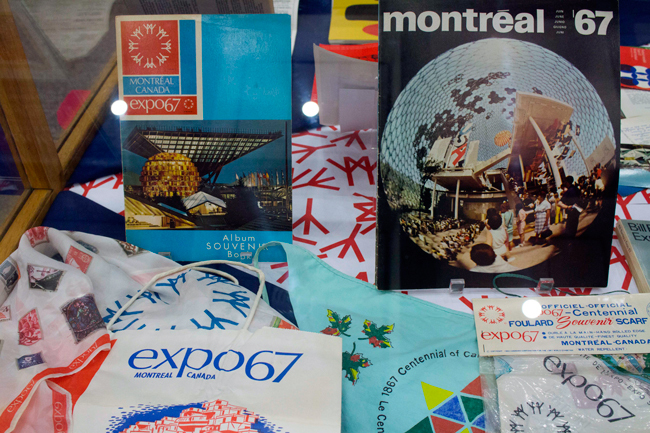 The cases of the McLennan Library Building Main Floor Lobby are filled with items that harken back to one of Montreal’s most exciting events – Expo 67. Brightly coloured passports, scarves, photos, trays, and souvenir bottle caps bring visitors back 50 years to a summer that, in many ways, was Montreal’s coming out party to the rest of the world. Adams shows her favourite part of the show which is a simulacrum of the desk of architectural historian Peter Collins, with a light box and slides, a vintage fountain pen and letter opener. On the other side of that section is the Polaroid land camera that belonged to her parents, who visited Expo but left her at home. The exhibition is the result of collaboration between McGill students, faculty, staff and alumni across departments. It was jointly curated by Adams; Jennifer Garland, Associate Librarian, McGill Library; and David Theodore, Assistant Professor, School of Architecture. Garland particularly likes the red Expo passports with photos of some very young visitors, now in their 50s, who loaned the items for the exhibition. Garland is particularly fond of the architectural plans of Children’s World designed by McGill Architecture professors John Schreiber and Radoslav Zuk for La Ronde. McGill @ Expo 67 looks at the role of Expo 67 in teaching and research, arguing for the continued relevance of Expo 67 for Canada’s next generation of university students. At least six MA and PhDs focussing on Expo have resulted from work done by graduate students using McGill Library’s Expo Collection and the John Bland Canadian Architecture Collection. This material will be available by consultation in the library following the exhibition. McGIll@Expo 67 will run until Dec. 21, in the McLennan Library Building (main floor, lobby). The next exhibition, Vaccination: Fame, Fear and Controversy, 1798-1998, will open on Jan. 12 and run until March 23. When the exhibition ends, people will be able to view Expo 67 materials by visiting Rare Books and Special Collections during opening hours. I have that souvenir booklet in the upper right hand corner!